Most armadillos are happy scratching sand and eating, but Bo longs for adventure. And adventure Bo gets, the day Harmony Jean breaks in her brand-new chili- pepper-red cowboy boots by the banks of Can Creek. Peering out across the creek bed, Bo is sure he's spotted a rip-roarin', rootin'-tootin', shiny red armadillo! Bo's off and running after his new friend--right down to the Curly H Rodeo. There Bo gets to do all the things he's dreamed of doing: he rides a bronc, eats red- hot chili peppers, and even tries the two-step. Bo is ready to follow his pal off into the sunset, but he is about to discover his new friend is no ordinary armadillo. 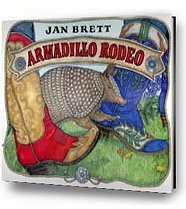 Jan Brett turns her considerable storytelling talents toward the Texas countryside in this warm and funny story of an armadillo on his own. Luckily, Ma Armadillo and her boys are searching for Bo in the borders to bring him back home.